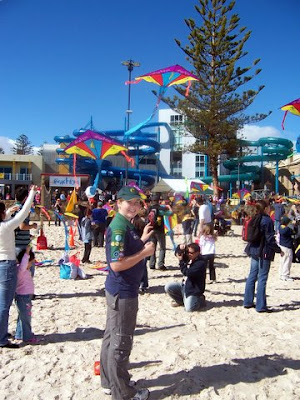 Leanne's Little Place: Windjam07 - Breaking a World Record in Kite Flying! 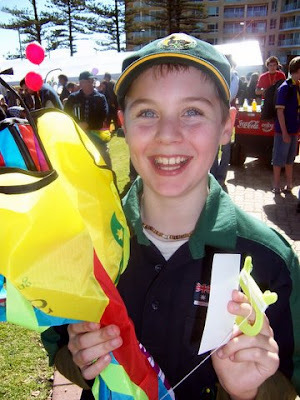 Windjam07 - Breaking a World Record in Kite Flying! Today was so much fun. 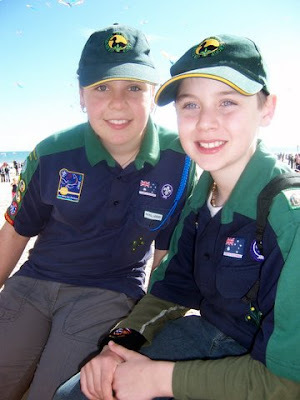 The kids love their Scouting and being 100 years since the beginning of Scouting this year has meant lots of fun activities to do to celebrate. 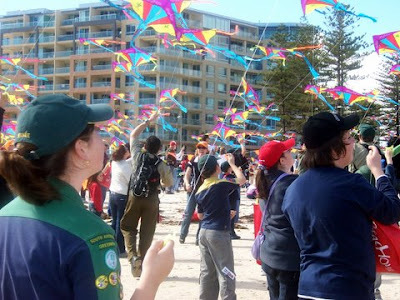 So today, was the day, that Scouting had decided to attempt to break the World Record for Kite flying. 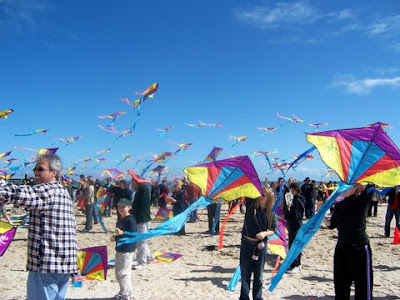 The record to beat was 627 kites in the sky at once, this had been set by Scouts in the UK, however they needed to have more than 927 kites in the sky to claim the record, this would therefore supercede another unofficial attempt also done by the UK. 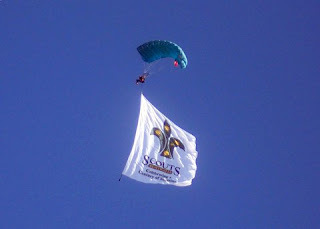 Before all the excitement of kite flying, the day started off with some pretty spectacular sky diving. 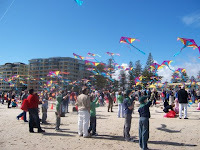 They succeeded, having managed to get 1127 kites up, the site was amazing and so much fun. The sky was clear, which made the effort even more spectacular. Apparently it takes about 3 months before official recognition, but all who attended are very confident that all went well! 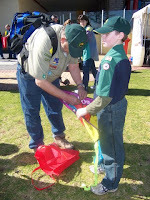 and here they are getting their kites ready for flying....not long to go now!!!!! And to finish off the day, had to get a nice pic of the kids before we headed home. 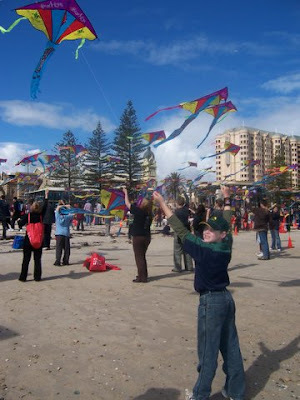 Once we got home, that was not the end of Kite flying, to fly a kite is so much fun, I remember when we were kids and mum would make them out of brown paper for us, we would spend hours flying them. 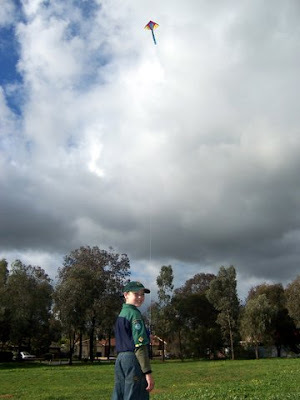 We luckily have a park across the road from our house, which was a perfect spot to get the kite out again for Aaron. 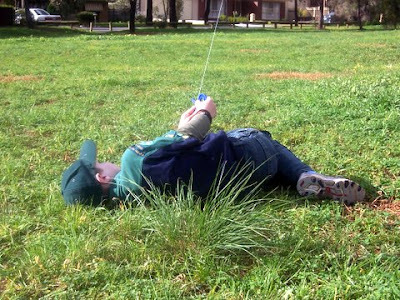 There is something about a boy and a kite, I love the last pic of the day.....total relaxation!!!! wow this is awesome Leanne. My husband is Sam who ran the Radio comms for this event today. 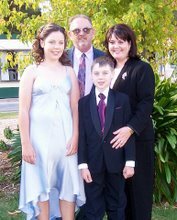 I hope you don't mind that I put a link to your blog to see some great pictures on WindJam07. Well done to all on the day it looked fantastic. 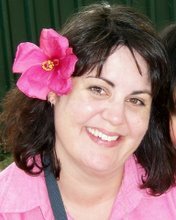 Hi Leanne, you don't know me, but I popped over to your blog on the advice of Lea (Sharai). 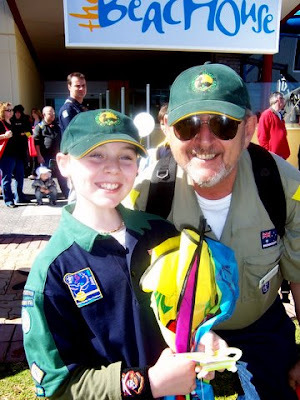 I am a scrapbooker friend of Lea's and I am also a Guide Leader in Queensland - so very interested in all things Scouting and Guiding. Congrats on Windjam07 - what an awesome effort. Well done to all involved. 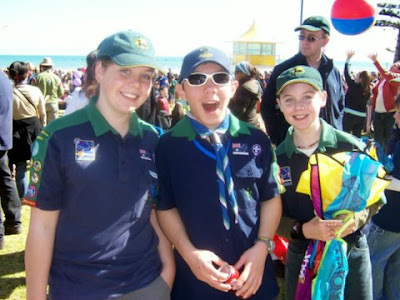 awesome leannes - my 3 all did joeys, then cubs and then scouts!! !